Suave and deadly, this crossbow is the pirates best friend. Fast to use and efficient, it is the go-weapon for extending the reach of your assault! and the pin guide is designed for the IDV-security-bolds and your own LARP storage. They keep the bolts on the string and allow a precise targeting. is made of stainless steel wire (V2A). This makes them completely weather resistant and tear resistant. is made of sturdy beechwood. The high-quality glaze emphasizes not only the natural grain, but also makes the wood resistant to weather and makies it rain repellent. of black fiberglass is particularly flexible, yet still robust. By a screw clamp can he easily be detached from the attachment so that the crossbow can be disassembled if necessary. The bow has a traction of 28 lbs. and its launching mechanism were designed based on historical models. We've optimized it for modern use and reliable operation. The handling is very easy, because the mechanism can lock the nut. 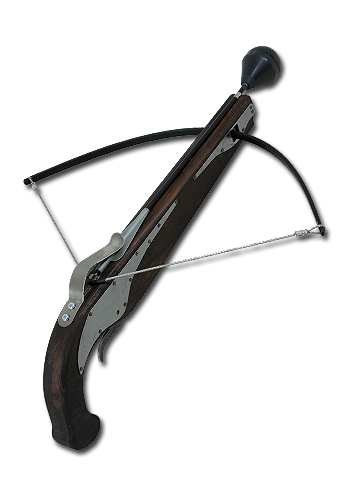 of the crossbow was shaped by hand and sturdy riveted. It helps with tension and gives you the stylish look of genuine historical crossbows. All crossbows are sold only with proof of age (minimum age 18 years); this means sufficient signed photocopies of your identity card, passport, birth certificate, or driver's license. You will need to send us a copy of the signed document via post, e-mail, or fax together with your order. The order will only shipped after your age has been verified. The one left in stock is waiting for a part to be delivered. Once that part arrives, it will be ready to ship. For shipments outside the USA using the USPS, please check the rules of your country to see if a LARP crossbow is allowed. We wish to emphasize that YOU are responsible for knowing and following the laws of your own country and state. Please do not order this item if it is not allowed where you live.